Careers in the performing arts tend to launch early. Ask a seasoned jazz star about his or her early days and you will likely hear about after-school bands, jazz camps, and “sitting in” with area pros. And when you have the opportunity to witness the rapid evolution of these talents, you begin to understand the passion that fuels artistry even before the vision is fully formed. 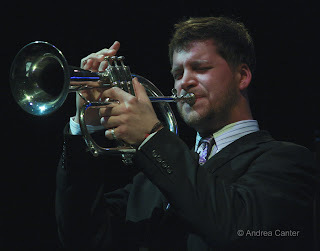 The John Raymond Project is the name of an ever-evolving ensemble propelled by trumpeter John Raymond, currently completing his degree at the University of Wisconsin–Eau Claire and looking to continue studies in New York. I first heard John, barely out of high school, perform with the early edition of Jeremy Walker’s Jazz Is Now! orchestra. A short time later, he invited me to the premiere of The John Raymond Project at Bryant Lake Bowl, where he had assembled some like-minded improvisers and composers from the jazz program at Eau Claire. Since then, he has not only starred with the college’s jazz bands but has been a frequent member of Nachito Herrera’s Cuban ensemble while continuing to refine and redirect the JRP. This is a young man exploring as much of the music as possible as he discovers his own voice as performer and composer, never losing sight of his spiritual as well as musical journey, finding inspiration in his faith as well as his horn. Few college student musicians appear on the Dakota stage as bandleader, but John has had several such opportunities in the past couple years, including last week’s prime time gig with his latest edition of the JRP. “This is my ideal line-up,” he says, and it was a knock-out performance of original compositions and arrangements. Since the Bryant Lake Bowl debut, John’s music has grown layers, his book increasingly diverse from hard hitting bop attacks (including Freddie Hubbard’s “Thermo” and “Intrepid Fox”) to lyrical ballads with memorable melodies (such as his original “Poor Blind Man”). 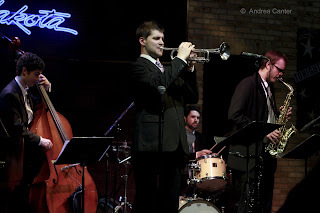 And his cohorts—recent UWEC grad Sean Carey on drums, fellow students Aaron Hedenstrom (saxes) and Andy Detra (bass), and 28-year-old “veteran” Tanner Taylor on piano—came together as if backed by a decade of collaboration. Photos: (top) John Raymond performed on February 5th at the Dakota; (bottom) The John Raymond Project at the Dakota (Tanner Taylor not pictured). Photos by Andrea Canter.